Create a 4th of July cake that stands out from the crowd this summer. Try one of the design ideas below, and you'll wind up with a cake that looks as good as it tastes! 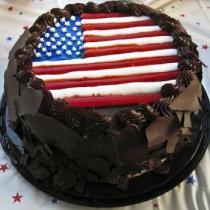 There are many different ways you can create a 4th of July cake, from flag cakes to cakes that have patriotic toppers. Consider some of these classic ideas. A flag cake is the quintessential 4th of July design, and it's easy enough that even decorators who are just starting out can pull it off without a hitch. Bake the cake and let it cool completely. Remove it from the pan and place it on a tray or wrap it loosely in plastic wrap. Freeze the cake for 20 to 30 minutes or until it begins to firm. Remove the cake from the freezer and take the plastic wrap off. Use the pastry brush to remove loose crumbs, especially around the edges and bottom of the cake. With your flat spatula, apply a very thin coat of icing to the entire cake; this is called a crumb coat. Return the cake to the freezer, and keep it there for another 15 to 20 minutes or until the crumb coat feels firm. After you take the cake out of the freezer for the second time, use your flat spatula to apply a thicker coat of frosting. Try to make the frosting layer as smooth as possible. 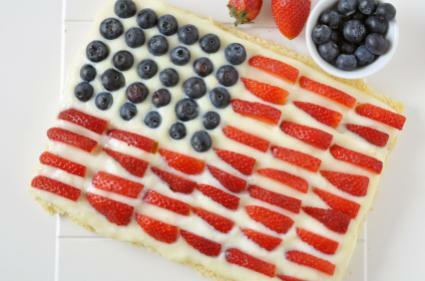 Place blueberries in a rectangle in the upper left corner of the cake to represent the blue rectangle at the corner of the American flag. Fill in the interior of the rectangle with rows of blueberries. Slice the strawberries into pieces of approximately the same size. Form the flag's red stripes by placing the strawberries in rows on the frosting, seeded side up. Remember to leave some space between the rows of fruit so the white frosting shows through as the white stripes. 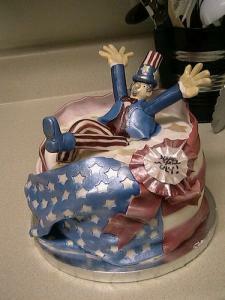 Top any cake with this edible Uncle Sam figure, or create the entire cake design. Building this figure is a huge challenge, but it can also be a lot of fun. If you prefer, you can use marzipan or gum paste instead of fondant to make the figure. Form a body, two legs, and two arms from white logs of fondant. Bend one leg as shown in the photo, and attach all of the limbs to the body using toothpicks or slim wooden skewers. Form two balls of fondant, tinted any skin tone you prefer, and shape them into hands. Mold the head for the figure out of a small ball of fondant colored to match the skin tone of the hands. Elongate one end of the head to form a neck. Hollow out small cavities in the head for eyes made from tiny balls of fondant; color them with edible paint. Shape small balls of fondant into a nose and ears. Press them onto the head. Attach the head to the body with a toothpick. Roll out a thin layer of blue fondant, and cut out rectangles to wrap around the figure's body in order to piece together a blue coat. Using the same blue fondant, form boots for the figure, and attach them with toothpicks. Form the hat from a log of white fondant. Roll out a thin rectangle of blue fondant and wrap it around the bottom half of the hat. Create a small roll of blue fondant to wrap around the bottom edge of the hat to create the brim. Cut out small white fondant stars, and stick them to the hat as shown. Finally, use edible paint to add stripes to Uncle Sam's legs/pants and hat. Paint in any finishing details you want. Attach the hat to the figure's head with a toothpick. Roll out sheets of red, white, and blue fondant approximately 1/8-inch thick. Cut a 4-inch circle out of the red fondant, and set it aside. Cut the rest of the red fondant into 2-inch wide ribbons. Set aside approximately 5-inches of the red ribbon. Cut a 2-inch circle out of the white fondant, and set it aside. Cut approximately half of the white fondant into 2-inch ribbons. Line up the red and white fondant together in stripes and press the edges together slightly to form the striped portion of the flag. Roll out the rest of the white fondant to match the width of the striped flag. Roll out the blue fondant to match the size of the white fondant. Cut out small stars out of the blue fondant, and remove them. Carefully line up the blue fondant on top of the white, and press the two layers together to form the front of the flag. Gently drape the flag around your cake, folding it like cloth in the front so the two edges overlap. Mold your extra piece of red ribbon into waves, and set it on top of the cake. Press the white circle on top of the red circle, crimp the edges slightly to create a ribbon medallion, and lay it on top of the wavy ribbon. If desired, use the edible paint to add a greeting message on the ribbon. Insert two toothpicks halfway into the Uncle Sam figure's bottom area. Center the figure over the cake, and gently push the exposed toothpicks into the top. Decorate the exterior of a round cake with red and blue circles for a fun 4th of July design. Cover the entire cake in white fondant, and smooth it out. Divide the remaining fondant in half, and divide one of those halves into half. Add red food coloring to the largest section of fondant, and add blue food coloring to one of the 1/4 sections of fondant. Knead each colored batch of fondant well to get even color distribution. Roll the colored fondants out to 1/8-inch thick, and cut out circles approximately 2-inches in diameter. You'll need mostly red circles, and you can place blue circles wherever you like. Cut stars out of the centers of the blue circles. Cut stars out of the white fondant, and place them into the star holes in the blue circles. 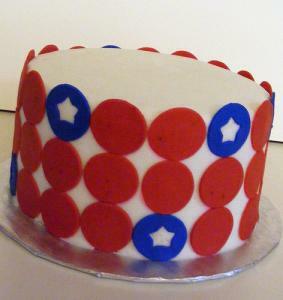 Cover the exterior of the cake with the red and blue circles for a fun, patriotic design. End the day's activities with a celebratory cake that shows off your decorating skills, regardless of your level. A 4th of July cake design does not have to be an elaborate creation that takes days to complete. Instead, try one of these simple-yet-spectacular creations. Patriotic eagle: Use an edible image or a piping gel eagle transfer to create an image of the national bird. Add a border to complete the cake. Declaration of Independence: Airbrush a rectangular cake with light beige edible paint, and let it dry. Use a stiff paintbrush and black edible paint to write the heading and first few sentences of the document on the cake top. Alternatively, copy the top and bottom of the Declaration of Independence and use small loops to represent the actual wording, depending on the look you want for the cake. Finish by piping a buttercream border around the top and bottom edges of the cake. Patchwork stars: Frost the cake in buttercream and cover it with fondant. Lightly trace a patchwork pattern into the cake. Pipe red icing over the traced lines and around the bottom of the cake for a border. Add small blue fondant stars to the center of the patches, or pipe stars using buttercream. Fireworks Cake: Nothing beats the vivid color you get from gel food coloring. Ice a standard round cake with white buttercream, and pipe red and blue gel icing in star bursts across the cake. You can mix in other colors, like yellow, orange or purple, for an especially eye-catching look. Birthday Present: Skip the traditional "Happy 4th of July" message, and make your Independence Day cake one that celebrates America's birthday. Turn a square cake into a birthday present by covering it in white fondant and attaching a red bow. Add some small blue fondant stars to complete the design. 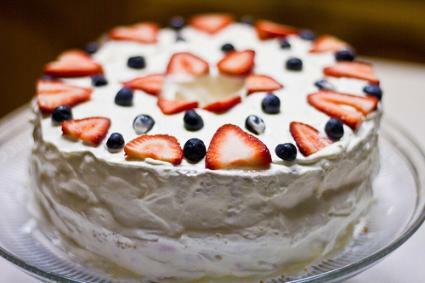 Berry Cake: If you don't want to make a full flag cake, add a few blueberries and strawberries to the top of any white cake to make an easy, patriotic-colored cake. 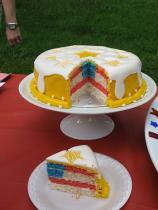 Flag Cake: Pipe the image of an American flag onto the center of any cake using butter cream frosting. Bunting Cake: Wrap your cake in a red, white and blue bunting made out of fondant. Mix up three bowls of fondant, one in each color. Roll all three colors out to about 1/4-inch thick, and slice them into ribbons. Attach the ribbons together to make a red, white and blue bunting you can drape around the cake. 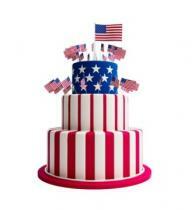 Wilton offers several ideas for patriotic cakes that are made using some of their popular pans. Try making one of these designs. The Country Cake uses the star-shaped pan. 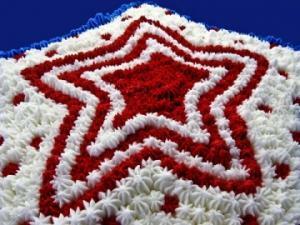 The Broad Stripes, Bright Stars Cake is made with the #1 pan. The Rockets Red Glare Cake is created with the enchanted castle pan. In addition to Wilton's designs, you can find plenty of shaped cakes on other cake decorating websites. If you're a more experienced cake decorator, challenge yourself by making a sculpted cake this 4th of July. A sculpted cake requires precision carving and a sturdy internal system of dowels and bases. You may also want to use fondant for these designs because it holds up better in July's typical heat and humidity. Consider sculpting one of the following designs. Of course, not everyone has the time or skills to create an amazing Independence Day cake that's suitable for presentation at a party. 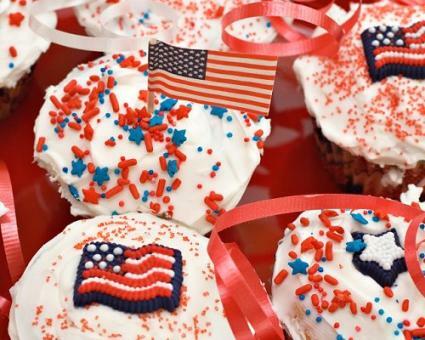 Instead, try making some simple 4th of July cupcakes that are easy to decorate and sure to be delicious. This 4th of July, thrill your family and friends with a cake that competes with the fireworks. Try any of these cake designs, and celebrate your holiday in true American style.